Here in the second installment of “K League Tactics”, we take a look at bottom place Incheon. Incheon have been slightly surprising in that they’ve been much poorer than people expected. Many, myself included, expected a weaker side than last season as they once again lost players during the offseason as the city (which owns the team) continues to struggle financially, but didn’t expect them to be “this” bad. So, why is Incheon struggling so much? Incheon, like most of the K League teams, usually operates in a 4-2-3-1 formation, but at times it can shift into something of a 4-1-4-1 or 4-3-3 like formation, usually depending on who is playing in certain positions. Perhaps it’s a sign of the club’s financial struggles that despite a woeful run of games, the team has largely stayed the same (in terms of players used). The back five (defenders + goalkeeper) have largely started almost every game. 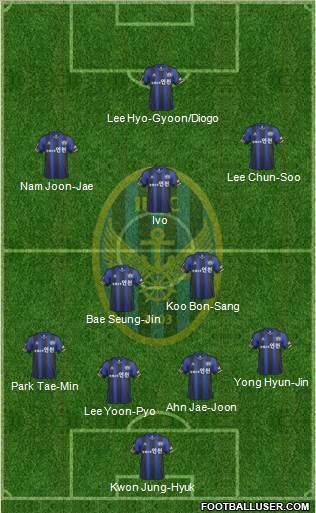 While Bae Seung-Jin, Koo Bon-Sang, and Ivo are the usual midfield three. Lee Chun-Soo has played most of the games out on the right wing, while Nam Jae-Joon starts most on the left (although Moon Sang-Yoon is playing with more frequency). Lee Hyo-Gyoon has been the regular forward, but the return of Diogo will likely see his playing time reduced. ???? – I want to say something here, but quite frankly Incheon just doesn’t excel in any area. The attack is hit or miss, the midfield is average, and the defense is sketchy. The team isn’t tactically brilliant, well organized, nor do they have a clearly defined style. Individual quality – The only thing Incheon does have going for them are a few decent individual players. Ivo is their best player, and he’s quite good on the ball and capable of beating defenders one-on-one. Moon Sang-Yoon has plenty of pace and running. Lee Chun-Soo isn’t anywhere near the player he used to be, but he’s capable of providing a nice pass here and there. Average, average, average – This may be on repeat, but the team is just average (at best). The attack has scored just eight goals thus far (lowest in the league) and the defense is near the bottom as well. No one player really should scare any team, even Ivo who’s their best. Korea national team watchers will be familiar with Incheon’s general style of play. The front four largely operate independently of the deeper two midfielders and the backline. The wide midfielders tend to stay wide while Ivo has a free role in the middle. Ivo will usually either drop deep to collect the ball in space or drift wide (often to his left) if the opposing fullback has gone forward. Push your fullbacks up – This needs be done a bit delicately (to avoid leaving too much space on the counter), but overloading Incheon on the flanks can lead to opportunities. The wide midfielders aren’t particularly interested in tracking back, and can be lazy in doing so. Challenge the centerbacks – A fairly obvious thing, but teams seem to do it less and less these days (preferring instead to try and pass around and over them). 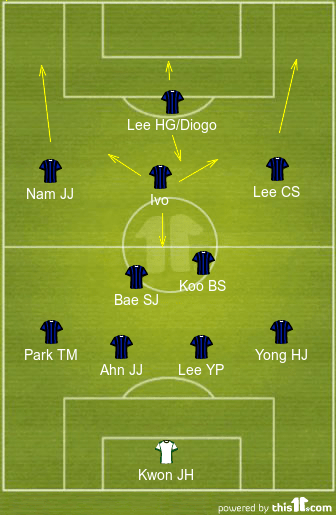 Lee Yoon-Pyo and Ahn Jae-Joon are fairly average defenders and both have a mistake in them. Shut down Ivo – The Brazilian is a notch above the rest of his teammates in terms of quality, and keeping him quiet and off the ball helps prevent Incheon from pushing forward. Normally Ivo will operate in the 10 spot, but if he can’t get the ball there he’s comfortable dropping into a deeper midfield role. Playing some sort of flexible man-marking scheme would probably be effective in stifling Incheon’s attacks. Leave a lot of space behind the defense (especially with slow keeper) – Lee Chun-Soo has lost a step or two of pace, and Ivo and Diogo aren’t the quickest. But Incheon has threats to get behind defensive lines, most notably left midfielder Moon Sang-Yoon. Be slow/sloppy in midfield – Incheon likes to press in the center of the pitch, from the middle third back, and players that dally on the ball will almost certainly be forced into bad passes or lose possession. Resort to long balls over the top – It’s a tempting option to bypass Incheon’s midfield press, but it’s a tactic unlikely to get you much of anything. A smarter decision would be to work the flanks and stretch the Incheon midfield as much as possible. Be patient and wait for them to tire and stop pressing or for them to drop deeper where it’s easier to keep them pinned into their own half. So why is Incheon at the bottom? Simply because the team is just average. In some ways it’s admirable, but it’s also a bit naive, but Incheon seems to be in denial about what kind of team they are. It feels like Incheon thinks that they’re a mid-table side who is just going through a bad patch, rather than a honest-to-goodness relegation candidate. Defensively they are far too open, and the somewhat lackadaisical way the front four tracks back doesn’t help things. Ivo is a good player, but he’s not a gamechanger nor is he someone that can consistently open up tight defenses. If Incheon wants to have any hopes of getting out of the relegation spot they’ll need to tighten up at the back and become more ruthless on the break. We’ll stick near the bottom for the next club and take a look at Gyeongnam FC. After them is there a team you’d like to see reviewed? Leaders Pohang? Giants Suwon? Plucky Jeonnam? Let us know in the comments! i’d like to get your analysis of suwon. Alrighty then. Suwon will be up after Gyeongnam, and that works nicely as the Bluewings will be in town on the 23rd to face Busan. I actually wouldn’t describe Incheon as “below average”, which may be odd considering the results they’ve gotten. individually they have some decent players, and a few results aside, they’re rarely blown away. They’re very thin though in terms of squad depth, so they can’t try new things or freshen up the XI which hurts them I think. In the last game I saw them play (against Seongnam) Incheon created quite a few chances but were very wasteful up top. Still, at least they are scoring! They will be doing better than expected if they get anything from their next few games though..
Yeah, Incheon is hard to summarize. 1 win from 15 is terrible, but when you watch them play they’re not terrible. Which why I ultimately described them as “average”. The league is tight enough that if a few results go their way they could move out of trouble, but based on what’s happened thus far that seems slightly unlikely. P.S. Saw your site from the waygook.org link/post. Nice stuff.